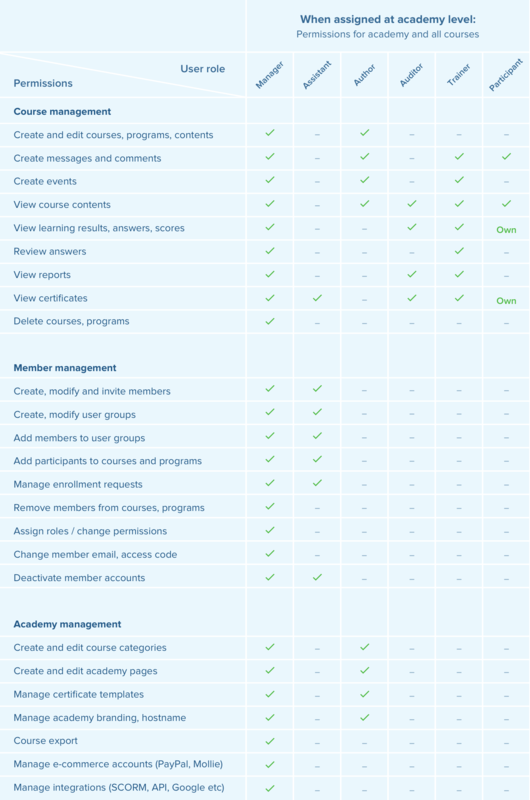 Which role gives access to which activities in a Coursepath academy? In this short documentation, designed for academy Managers and administrative staff, we want to help you to get a better understanding of how the user roles and permissions in Coursepath are set up. How are tasks divided in Coursepath’s role system? Roles are now clearly related to common tasks: user management, content management, reviewing and reporting, and training. You can assign roles on academy level as well as on course level. Important to know: Several roles can be given to each member. There is no limit on the number of roles that you can create and assign in the online academy and in a course. You can have as many managers as you like, for instance. Same applies for the other roles. Also, each user can have multiple roles. A typical example is the following: An employee is participant on academy level, which gives him the least amount of rights. On course level he can have the author role. This way he can create and edit content in this specific course. Is he meant to have all the rights for a particular course, assign him the assistant, trainer and author role for the course. He will not have those rights for all the other courses, unless you assign him these roles. Who manages roles and permissions? User permissions and access settings are specified in the profile of each user. Only Managers are authorized to assign and change user roles. The security layer in each online academy is designed and built with a corporate climate in mind. Role hierarchy is taken into account to determine the levels of access users have to your organization’s data. Roles within the hierarchy affect access on key components such as system setup, learning content and reports. Coursepath delivers a clear-cut permission model. This guarantees your organization a clearly defined role policy in the online academy and a security framework that is adapted as best practice by many organizations. From „old“ to „new“ system – What do I have to do? Roles assigned before March 20th 2017 are automatically converted so they reflect your users previous permissions. Hence, a previous trainer will be a trainer and an author. A previous assistant will be assistant and author. Previous owners and managers will both be managers. Because the new roles and permission system will offer more flexibility, this would a good time to review your staff’s permissions and make changes accordingly.